Welcome to A Special Angel’s Touch Inc.
A Special Angel’s Touch is a Home Health Agency who provide non-medical services for children and adults with Special Needs and Developmental Disabilities in the comfort of their residence. Our mission is to provide optimal home health services to those with such but not limited to, Quadriplegia, Down Syndrome, Autism, & others. We serve clients within the areas of Miami-Dade and Monroe County in the state of Florida. Our team members are knowledgeable, and willing to go the extra mile in providing all the physical, mental and emotional support your loved one needs. All members of our staff are bilingual in English and Spanish. They are also specially trained in their areas of Home Health Service (Home Health Aides, Certified Nursing Assistants and Behavioral Assistants). We are dedicated to the quality and assurance of the staff we hire here at A Special Angel’s Touch. Every applicant we receive is screened, insured, and bonded for general qualification purposes. Only YOU can do the right thing to prevent abuse ! Our vision is to become the preferred provider for our quality services in home health care. Our clients drive us to provide the best possible care, so that they can live happy, healthy lives. We are committed to providing the best in value, reliability and quality in the communities we serve. Building a strong relationship with our clients and their families is something we strongly believe in, and we go to great lengths to ensure the best quality of life and service. 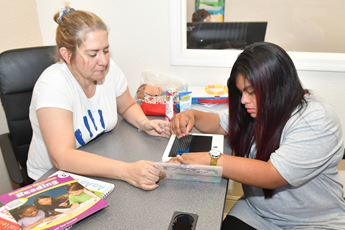 A Special Angel’s Touch INC will provide clients at home with Applied Behavioral Analysis which can consist of services provided to assist a person to learn & replace new behaviors that are directly related to existing challenging behaviors or functionally equivalent replacement behaviors for identified challenging behaviors. Personal support, Respite Care, Life Skills Development, Behavioral Assistance, and all other therapies. To learn more about our personal care service please contact us.